A Businessman Aka Udofia has offered Super Eagles $20,000 for each goal scored in Mondays 2018 FIFA World Cup second leg qualifying cracker against Cameroon. A statement by the Nigeria Football Federation (NFF), the young businessman from Akwa Ibom, made the promise as he briefly greeted players and officials inside the chartered ARIK Bombadier CRJ 1000 aircraft just before take-off at the Ibom International Airport, Uyo on Sunday afternoon. I am a good friend of the NFF President, Mr Amaju Pinnick, and I am happy that I am here in time to see you guys before take-off for Yaounde. I watched the game against the Cameroonians here in Uyo on Friday and I am sure you have the ability to conquer them again in their own territory. Udofia, Chief Executive Officer of Desicorn Company, announced to the applause of players and officials thatI promise to reward you with 20,000 dollars for every goal scored in Yaounde. 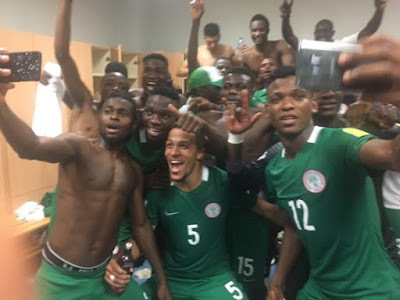 Three-time champions, Nigeria, will play Cameroon on Monday in Yaounde in a Day Four encounter of the 2018 FIFA World Cup Africa qualifying race with five points clear of second-placed Zambia and seven ahead of third-placed Cameroon.